Soft, fluffy baked potatoes have long been a standard side dish for many meals, especially when grilling steak. Maybe too long. 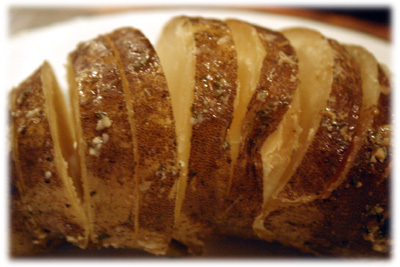 Aren't you getting a little tired of the same old boring baked potato recipe? 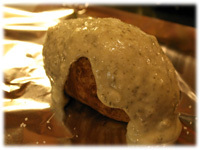 Want to learn a simple trick that takes an ordinary baked potato and literally infuses it with extraordinary flavor? 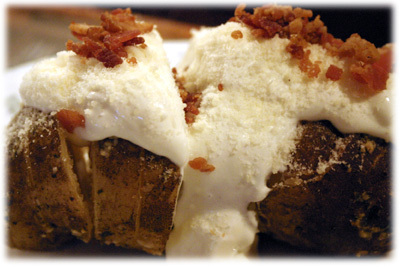 Look at that baked potato just above - doesn't it look fantastic? You can get that by partially pre-slicing the potato, rubbing it with oil, kosher salt and then bathing the whole potato with softened garlic butter. 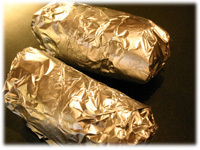 Wrapping it all up in foil ensures the flavors infuse into the heart of the potato while cooking. With this recipe you still get to top it with all your favorites, sour cream, bacon, chives and parmesan cheese. Tip: quickly make your own garlic butter by adding 2 tablespoons of minced garlic from a jar with 1 cup of softened butter, mixing well. 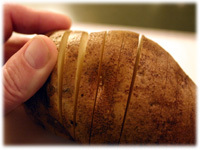 Place the baking potato on a cutting board and very carefully begin making slices 1/4" apart partially into the potato, along the length of it. 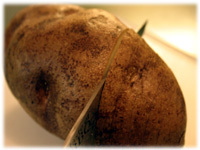 Try to ensure you don't slice completely through the potato or it will be harder to manage. You should be able to slightly fan the slices apart but keep the potato intact. Soften the garlic butter but do not melt it. 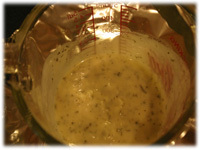 The butter should be thick like a sauce, not a thin liquid. 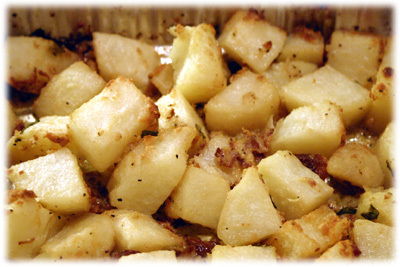 Lightly cover the potato in oil and roll it in kosher salt to coat evenly. Place it on a sheet of foil and pour about 1/4 cup of softened garlic butter over it. Allow the butter to seep down in between the slices you made in the potato. 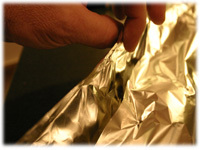 Bring 2 edges of the foil together over the potato. 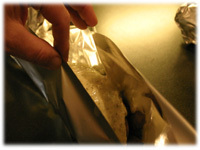 Fold the edges over on themselves several times to ensure the butter stays in the foil while cooking. Roll up each end to completely seal the potato in. 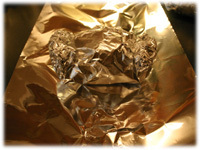 Place the potato on another sheet of foil and repeat the process of folding the foil around it once more. Setup the barbeque or grill for indirect heat and preheat to 350F - 375F. 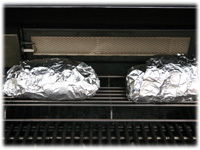 When the grill reaches this temperature place the wrapped baked potato on the BBQ. Tip: if your grill has a warming rack I find this the best place to put the potatoes to cook. They're away from direct heat and you can still use your grill to cook other food. When the baked potato's cooked remove it from the wrapper and slightly fan the slices apart. Cover it with your favorite toppings.